I closed my eyes and pictured the moment that inspired me to finish composing ‘Like Father Like Daughter’. I was spending time with my father, for the first time in a long time and had opened up to him about challenges I was going through at the time. He could immediately relate, as we are both very similar in character. Besides, he knows me all too well. ‘You need to take time for yourself’, he had told me. ‘Dedicate time for things you truly love’. ‘I do, dad. Playing the piano is my time for me. My time to unwind and to feel inspired. Look, I started on a new composition.’ And I began to play the same piece that I was about to perform before an audience of international pianists and piano fans at the Berliner Philharmonie. Having recalled a truly emotional moment with my father, I was able to bring out overwhelming emotions in the performance of my now completed composition ‘Like Father Like Daughter’, a song that I dedicated to my father, my role model. He had pushed me to keep going with music, to keep pursuing what I love, to find time for myself and to never put a cap on where this pursuit of music composition could take me. And he had been right. Playing in the Berliner Philharmonie was a dream-come-true for me. It was an overwhelming feeling to have the honor of sharing this stage with professional concert pianists at the Enlightened Piano Radio Awards concert. These feelings of excitement and ecstasy showed in my performance, and I’m very thankful for that. Luckily no mess-ups or nervousness this time around – I had learned from my previous performance (see previous blog post on the performance at the Whisperings Discovery Concert) 😊. Bringing myself back to that intimate moment of bonding with my father allowed me to get over my stage fright and to play with passion. And this exactly is the goal of every musician, to play with a force and momentum that will touch your audience, to stir powerful emotions that will create a lasting experience. Having accomplished this was an immensely satisfying feeling. 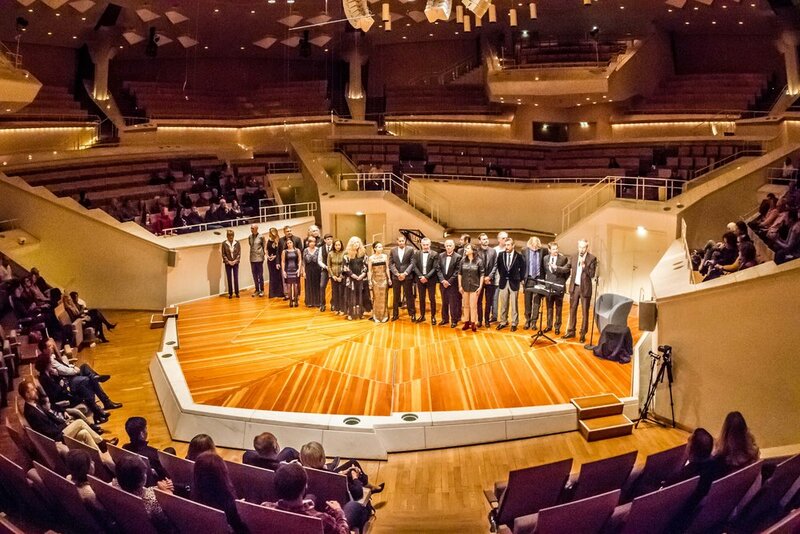 The most memorable part of the concert, however, was not my performance itself, it was the bonds that were built with over twenty pianists from around the globe, who all flew out to Berlin for this performance. Enlightened Piano Radio is more than a radio station – it is a tremendously supportive community of artists who openly share advice with each other and inspire each other. In such a competitive landscape of music, it is refreshing to step into a community of artists where this sense of competition is foreign. It’s all about empowering and enabling your fellow musicians, and it was such an honor for me to be welcomed into this community with open arms. The strength of this community shows in the successful organization, execution and hosting of this concert in one of the most traditional and famous venues in music history. A special thank you to Christoph Pagel, Louis Colaiannia, Donovan Johnson and Cathy Oakes for the tremendous energy you have dedicated to this concert and to the growth of this community! Thanks to people like them, I believe that there is no limit to the opportunities that lie ahead for EPR. What we heard and witnessed this weekend is a pre-taste of all the amazing things that will come from these musicians. Some of my favorites from this concert were a breathtaking piano / cello duo performance by Ben Dowling, a jazz piano original by Milana Zilnik, and a powerful piano solo by Ovidio de Ferrari, with a title that is very fitting to the overall theme and emotions felt during the concert - ‘Limitless’. Limitless is what I truly feel about the potential of this community of pianists. Leaving Berlin, I am filled with gratitude. For the invitation to perform, for my husband accompanying me on this trip, for witnessing a splendid piano concert, and most of all, for the new relationships forged with incredibly talented pianists, and for the special memories formed with the EPR community.